Engelhardt, Nina. Modernism and Mathematics: Modernist Interrelations in Literary Fiction. Edinburgh: Edinburgh University Press. Under contract. Engelhardt, Nina and Julia Hoydis. ‘Special Issue: Doing Science’. Interdisciplinary Science Reviews 42.3 (2017). Engelhardt, Nina. ‘Mathematics and Modernism’. Handbook of Mathematics and Literature. Ed. Robert Tubbs, Alice Jenkins and Albert Wachtel. Basingstoke: Palgrave. In Review. Engelhardt, Nina. ‘Modern by Numbers – Modern Mathematics as Model for Literary Modernism’. Being Modern: The Cultural Impact of Science in the Early Twentieth Century. Ed. Robert Bud, Paul Greenhalgh, Frank James and Morag Shiach. London: UCL. In Review. 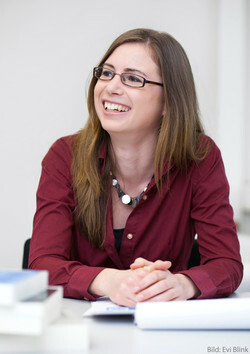 Engelhardt, Nina. ‘Pynchon and Mathematics’. Thomas Pynchon in Context. Ed. Inger Dalsgaard. Cambridge: Cambridge University Press. Forthcoming. Engelhardt, Nina. ‘When you come to a fork in the road, take it.’ – Multiple Geschichtsentwürfe und alternative Welten in Thomas Pynchons Against the Day’. Was wäre wenn? Alternative Gegenwarten und Projektionen in die Zukunft um 1914. Ed. Isabel Kranz. Munich: Wilhelm Fink, 2017. In print. Engelhardt, Nina. ‘Scientific Metafiction and Postmodernism’. Zeitschrift für Anglistik und Amerikanistik Special Issue: Aspects of the Science Novel 64.2 (2016). 189–205. Engelhardt, Nina. ‘Mathematics between Totalitarian Order and Revolution: Yevgeny Zamyatin’s We’. Imagine Maths 5; Between Culture and Mathematics. Ed. Michele Emmer, M. Abate, M. Falcone and M. Villarreal. Bologna: Monograf, 2016. 91–101. Engelhardt, Nina. ‘Scientific Metafiction and Historiographic Metafiction: Measuring Nature and the Past’. Twentieth-Century Rhetorics: Metahistorical Narratives and Scientific Metafictions. Ed. Giuseppe Episcopo. Napoli: Cronopio: 2015. 145–72. Engelhardt, Nina. ‘Formulas between Authority and Freedom – Mathematical Views from Modernity to Modernism’. Variations 21 (2013). 131–144. Engelhardt, Nina. ‘The Role of Mathematics in Modernist Utopia: Zamyatin’s We and Pynchon’s Against the Day’. Utopianism, Modernism, and Literature in the Twentieth Century. Ed. Alice Reeve-Tucker and Nathan Waddell. Basingstoke: Palgrave Macmillan, 2013. 130–47. Engelhardt, Nina. ‘Mathematics, Reality and Fiction in Pynchon’s Against the Day’. Thomas Pynchon and the (De)vices of Global (Post)modernity. Ed. Zofia Kolbuszewska. Lublin: Wydawnictwo KUL [John Paul II Catholic UP], 2013. 212–31. 2016: 'The Mathematics and Modernism of Zamiatin's We: Dystopia or Revolutionary Remedy?'. Russian Research Seminar, University of Edinburgh. Guest Lecture. 2014: '"When you come to a fork in the road, take it." - Multiple Geschichtsentwürfe und alternative Welten in Thomas Pynchons Against the Day'. Goethe-Institut Prague. Was wäre wenn? Alternative Gegenwarten und Projektionen in die Zukunft um 1914. June 2012: ‘Face to Face in the Imaginary Domain: Mathematics and Literature in Musil’s The Confusions of Young Törless and Pynchon’s Against the Day’. Queen Mary, University of London. Face to Face – Encounters between the Arts and the Sciences. Interdisciplinary Colloquium. 2011 and 2010: ‘Change, Prediction and Fiction – Mathematics in Thomas Pynchon’s Gravity’s Rainbow’, University of Antwerp, Belgium. with Harald Engelhardt. 'The Momentum of Pynchon’s Secret Formula: Gravity's Rainbow’s Second Equation between Archival Sources and Mathematico-Ethical Fiction'. International Pynchon Week 2017, Pynchon’s New Worlds. June 2017. Response in Fiction Meets Science Workshop: 'Beyond the Literary Science Novel? Genres of Narrating Science and the Case of Climate Change Fiction'. Hanse-Wissenschaftskolleg, Institute for Advanced Study, Delmenhorst. December 2016. 'Techniques between (Corpo)Reality and Flights of Fancy: Literary Negotiations of Bodies in Flight'. a.r.t.e.s. Graduate School, University of Cologne. Research Lecture in lecture series Körpertechniken – Imaginationstechniken. July 2016. 'Bodies in Flight in Early Modern Literature: Literary Texts between Science and Flights of Fancy'. Work in Progress Seminar. Institute for Advanced Studies in the Humanities, University of Edinburgh. May 2016. 'Ascent between Explosion and Grace: High Technology and Imaginary Heights in Thomas Pynchon’s Gravity’s Rainbow and Against the Day'. Institute for Advanced Studies in the Humanities, University of Edinburgh. Above. Degrees of Elevation. May 2016. ‘Modern by Numbers: Modern Mathematics as Model for Literary Modernism’. Institute of Historical Research, London. Being Modern – Science and Culture in the Early 20th Century. April 2015. ‘Mathematics as Hope against Dystopia in Zamyatin’s We’. Istituto Veneto di Scienze, Lettere ed Arti. Matematica e Cultura 2015. March 2015. ‘From Universal Force to Fictitious Force – Gravity in Thomas Pynchon’s Gravity’s Rainbow’. University of Erlangen-Nuremberg – Inaugural conference of ELINAS; Erlangen Center for Literature and Natural Science. May/June 2014. ‘The Imaginary Powers of Imaginary Numbers’. Leipzig University – The Common Denominator; A Postgraduate Conference in British Cultural Studies. March 2014. ‘Gravity in Gravity’s Rainbow – Force, Fictitious Force, and Frame of Reference’. Durham University – International Pynchon Week. August 2013. ‘Modernism and Mathematics – Modern Mathematics as the “clearest example” of the “foundational crisis of the World’. Cardiff University – Alternative Modernisms: An International, Interdisciplinary Conference. May 2013. ‘Measuring the Earth and Measuring the Past – Metafictional Reenchantments’. Cardiff University – Annual Conference of the British Society for Literature and Science. April 2013. ‘The Strange Case of Modernist Mathematics and Fiction’. The University of Edinburgh – Modernisms, Histories and Methods; Meeting of the Scottish Network of Modernist Studies. July 2012. ‘The “New Method of Thought itself”: Mathematics in Robert Musil’s The Man without Qualities’. University of Oxford – Annual Conference of the British Society for Literature and Science. April 2012. ‘Mathematics in Literature’. Poster and Presentation. Universität Bern und Institute of Advanced Study in the Humanities and Social Sciences Bern, Schweiz – Transformations: TransForming Knowledge and Epistemic Cultures. January 2012. ‘The Role of (Modernist) Mathematics in Musil’s The Man without Qualities and Pynchon’s Against the Day. Institute of English Studies, London – New Work in Modernist Studies. December 2011. ‘The Imaginary Domain as Transition Zone: Mathematics, Language and Reality in Musil’s The Confusions of Young Törless’. University of Glasgow – Colloquium: Literature and Mathematics in the Long Nineteenth Century. May 2011. ‘Mathematics, Reality and Fiction in Thomas Pynchon’s Against the Day’. Maria Curie-Sklodowska University, Lublin, Poland – International Pynchon Week; Of Pynchon and Vice. June 2010. ‘Utopia in Modern Mathematics – Reality, Mathematics and Fiction in Hermann Broch’s The Sleepwalkers and Thomas Pynchon’s Against the Day’. The Birmingham and Midland Institute – Modernism and Utopia: Convergences in the Arts. April 2010. ‘Mathematics, Reality, and Fiction in Hermann Broch’s The Sleepwalkers and Thomas Pynchon's Against the Day’. Northumbria University, Newcastle – 5th Annual Conference of the British Society for Literature and Science. April 2010. ‘Mathematik in der Literatur – Mathematik, Wirklichkeit und Fiktion in Thomas Pynchon’s Against the Day’. Max-Planck-Institute for the History of Science, Berlin, Germany – 4. Studientag Literatur und Wissenschaftsgeschichte. June 2009. ‘Textual Revolution in Mathematics: Mathematics, Reality, and Fiction in Thomas Pynchon’s Against the Day’. University of Stirling – Textual Revolutions; An Interdisciplinary Postgraduate Conference. May 2009.